NYC's coolest purveyor of lighters, IGNITED New York, is having a "Happy Holi-Blaze Party!" on December 17th, 7 to 10 p.m., at 135 Thames Street in Brooklyn. Their limited-edition, portrait lighters feature images of "nightlife stars, performers, singers, musicians, dancers and DJs" like Michael Musto, Andrew WK, Dazzle Dancers, Debbie Harry and dozens of others. Stop by and pick up a few stocking stuffers for only $5 each -- they've also got stickers for only $1 so you convert your ugly old lighter into something unique. Proceeds go toward funding the ongoing project and to publish a book. Hosts for the night are Eric Schmalenberger and the IGNITED crew: Steve Ellis, Michael Formika Jones, Doerte Fitschen-Rath, Misa Martin and Michelle Kaminer. Mexico City-based artist Pia Camil will have her first solo museum installation in NYC on view in the New Museum (235 Bowery) Lobby Gallery from January 13 to April 17th, 2016. Camil invites the public to participate in the ongoing creation of the work, "A Pot for a Latch," by exchanging their own items for others in the installation. 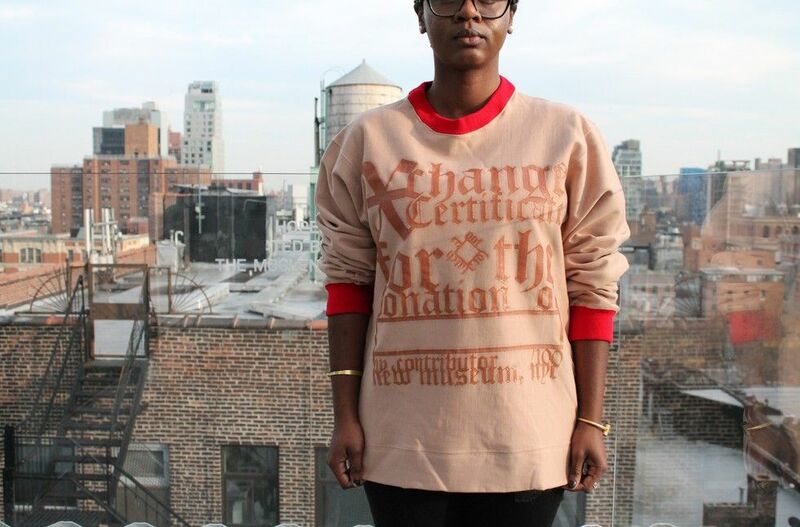 The first "exchange day" is Thursday, December 17th, 5 to 9 p.m., and you're invited to bring in a personal object and exchange it for one of 100 sweatshirts designed by the artist in collaboration with Lorena Vega. Camil hopes that your object will be "a talisman of sorts...a gift that has both a personal value and a history." There will be 5 more "exchange days" during the run of the show. All the details are HERE. 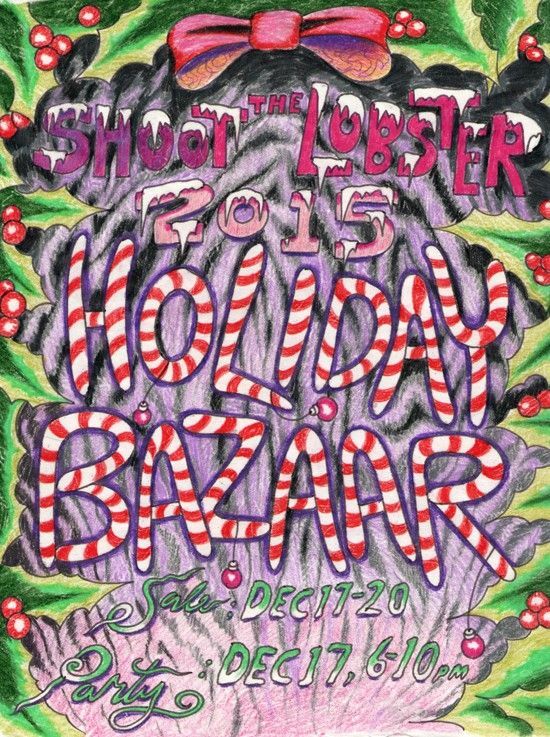 Shoot the Lobster (138 Eldridge Street) opens their 2015 Holiday Bazaar on Thursday, December 17th, 6 to 10 p.m., and then the bazaar is open daily, noon to 6 p.m., through Sunday. On Tuesday, December 22nd, the gallery hosts the second edition of Cara Benedetto and Aura Rosenburg's "Wrapping Room" where you can have your gifts personally wrapped by the two artists. Houston-based artist Sondra Perry's "My Twilight Zone Thing" session at RECESS (41 Grand Street) is coming to an end this week, and there's a closing reception on Thursday, December 17th, 7 to 9 p.m., with a special performance by Black femme DJ/producer Mhysa. 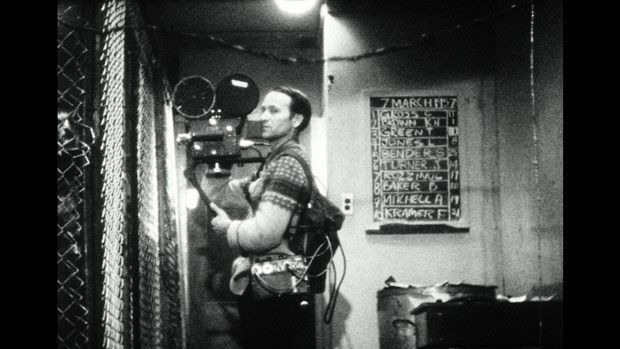 Artists Space (55 Walker Street) hosts an evening with filmmaker Jonas Mekas on Friday, December 18th, 7 to 9 p.m., plus screenings of his 1964 film The Brig produced with The Living Theatre, and Storm de Hirsch's Newsreel: Jonas in the Brig. The night is part of their ongoing survey of Union Gaucha Productions, running through January 10th, 2016. Mekas had advised UGP founders, Karin Schneider and Nicolas Guagnini, on the purchase of their first 16mm camera in the 90s. 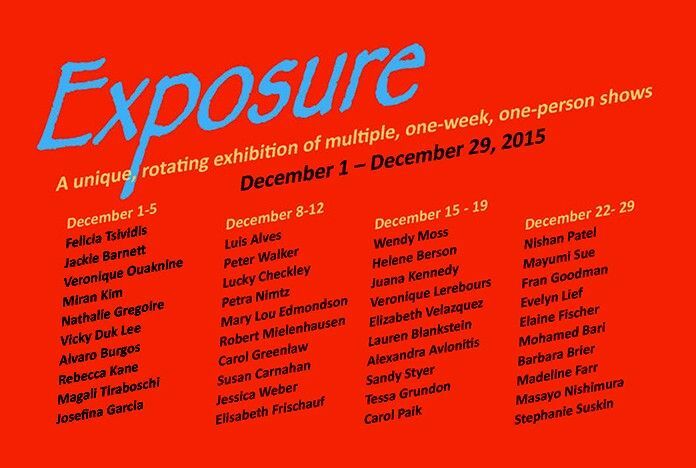 Ceres Gallery (547 West 27th Street, Suite 201) continues their month-long show, "Exposure," featuring "young artists, under recognized artists, and artists of various backgrounds." This week's artists are Wendy Moss, Helene Berson, Juana Kennedy, Veronique Lerebours, Elizabeth Velazquez, Lauren Blankstein, Alexandra Avlonitis, Sandy Styer, Tessa Grundon and Carol Paik. The exhibition wraps up with a final group of 10 on view from December 22 to 29. 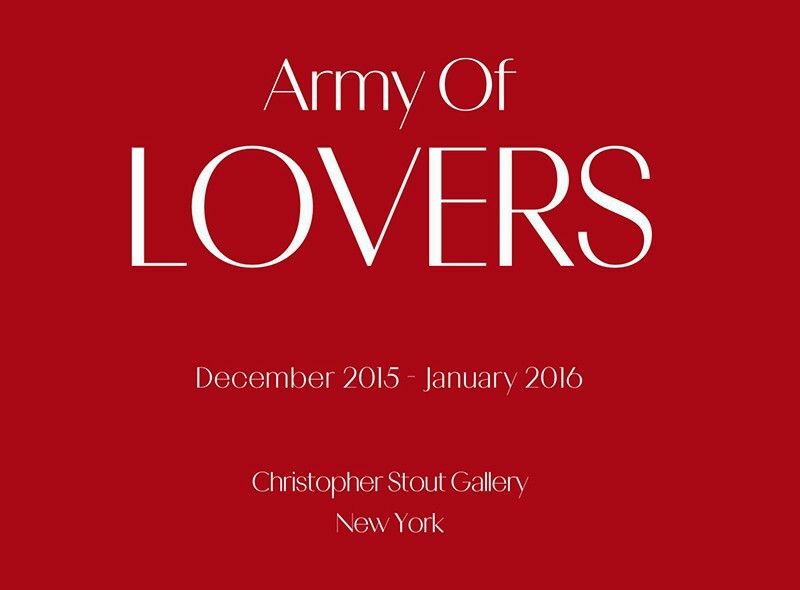 Christopher Stout Gallery (299 Meserole Street, Brooklyn) opens a group show called "Army Of Lovers" on Friday, December 18, 6 to 9 p.m. and up until January 24th. The gallery is known for showing "work that is challenging to authority paradigms, feminist, queer, anti-establishment, hyper-aggressive, mystic, and/or joyously sexual." The artists include Josh Kil, Kelsey Shwetz, Kenny Colors, Vincent Tiley and many more. Benrubi Gallery (521 West 26th Street, 2nd floor) opens their first solo show, "Bedside Manner," by the Brooklyn-based photographer Corinne May Botz on December 17th, 6 to 8 p.m. The works "blur the line between the actual and the artificial." On view until February 6th. The Lodge Gallery (131 Chrystie Street) has a group show called "Between Us" opening this week and up until January 24th. All the works are by four generations of New York Academy of Art alumni and faculty. 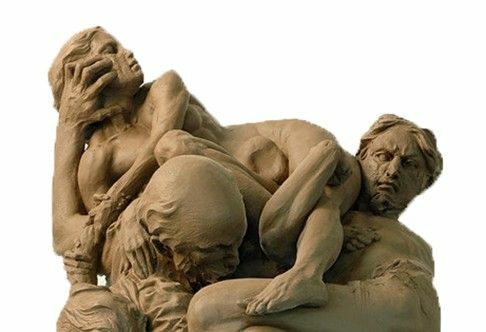 The artists include Peter Drake, Michelle Doll, Dina Brodsky, David Kratz and more. It was curated by Benjamin Martins and Melanie Vote. Howard Greenberg Gallery's (41 East 57th Street. Suite 1406) "Sequentially Sought" exhibition, featuring photos by Marvin E. Newman shot in NYC and Chicago in the 50s, opens on December 17th, 6 to 8 p.m. The works explore street subjects "in rhythmic riff and repetition" -- plus there's a short film made by Newman and Yashiro Ishimoto. On view until the end of January.